The ultimate dog walking / leash accessory is here and it's - very appropriately - called the DawggieGoPak. DawggieGoPak was created by Ethel Rudolph out of love and necessity. She became a first time dog owner - times two! - and proud parent of Bella and Lexi in December of 2008. Walks quickly became interesting. With a cell phone here, poop bags there and keys around her wrist, Ethel thought there had to be a better way. She searched pet stores and scoured the Internet for something to keep it all organized, but nothing was available. So, off to the fabric store she went and DawggieGoPak was born. DawggieGoPak is truly the perfect solution for all doggy parents. While it's compact in size at just 4.5" x 7", it is big enough to hold all of your on-the-go necessities. The pack can hold your cell phone, keys, treats, lip balm, MP3 player and mini hand sanitizer in 3 roomy pockets, while poop bags become quickly accessible through a special pocket with built-in grommet. DawggieGoPaks are made of water resistant fabric, easily attach to your dog leash and keep your goodies secure with heavy duty Velcro on both the flap closure and back pocket. Ethel built her company, Dawgs on the Go, on two principles: "what you give, you get back" and being able to say "Proudly made in the USA!" Of course, you know that I hold a special place in my heart for things Made in the USA, but what I love even more is when a wonderful company opts to give back! When you order a DawggieGoPak, please use the code FOR (enter in the "coupon or gift card" box and hit "update cart") and 25% of your purchase will be donated to the rescue of our choice, which is Friends of Retrievers (FOR)! The Lapdog household loves our DawggieGoPaks and have given them the official 16 Paws Up Lapdog Seal of Approval! Available in several colors and ribbon combinations, there is sure to be a DawggieGoPak to fit every one's taste. Buy one, or buy a few... you can never have too many, especially if you are a multi-dog household. 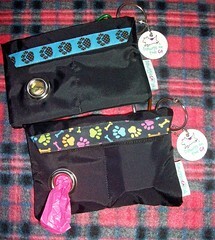 DawggieGoPaks also make fabulous gifts for doggy parents. Have a coworker who just adopted a new pup? A family member who just can't seem to find everything she needs when Fido whines to go out? Maybe even just a friend with four of the cutest Lapdogs around (okay, maybe that's a little hint that I have been eyeing the this red one and this hot pink one)? REVIEW: Lazy Dog Cookie Co.
Has Your Knitting Gone to the Dogs? Do I Make You Hungry?